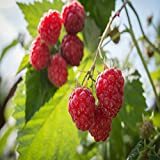 Raspberry plant for sale is best planted in the early spring or during the dormant season between November and March provided that the soil is not frozen. Raspberry plant for sale is in two forms: bare root canes or in containers. There are two types of raspberries with their own specific requirements for growing. Summer-bearers bear one crop per season, in summertime. Ever-bearers bear two crops, one in summer and one in fall. Location – For best results, plant them in a sheltered sunny location. They can also tolerate part shade. 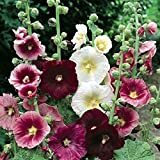 You can place them in your garden planted in rows or grow them in containers. Avoid windy sites as much as possible and clear the site of perennial weeds. 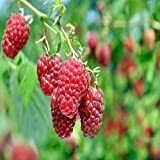 Plant your raspberries far from wild growing berries to lessen the risk of spreading pests and diseases to your garden. Soil – Raspberries prefer a moisture-retentive, fertile and slightly acidic soil which is well-drained and weed free. Soil pH should be around 6.0. 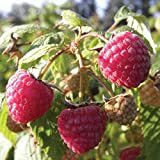 Do not plant raspberries in soggy and shallow chalky soils. Prepare the soil a couple weeks before planting. Prepare a raised bed to eliminate risk of root rot and then add 3 inches of thick mulch composed of bulky organic matter. Do not use mushroom compost or overly rich farmyard manure which can burn the new shoots. Planting – Raspberries love moisture, so try soaking the roots for an hour or two before planting. Dig a hole that is roomy enough for the roots to spread. Space plants about 3 feet apart and 8 feet apart in rows. You may need to place a support system depending on the variety you planted. A trellis or fence is a good option. If you chose to use one of these, establish them at or before time of planting so the plants are not disturbed when maturing. Water – Water one inch per week. Drip irrigation is the ideal way to water raspberries. If you don’t have a drip system, a soaker hose used for an hour or two each week should do the trick. Pruning – Prune the canes to within 10 inches off the ground after planting. Regular annual pruning afterwards will bring healthier plants and better quality of crops. Prune to get rid of older canes in favor of newer canes that will produce fruit. Fertilizer – Apply a slow-release general fertilizer in early March. If the growth is weak, you may apply sulfate of ammonia or dried manure pellets. Raspberry plants need a significant amount of nitrogen to grow to their full 6 or 7 feet, but you should stop pushing high-nitrogen fertilizer on them as fruiting time approaches. Harvesting – Pick raspberries on a dry day and the berries will ripen over a time of about 2 weeks. Don’t tug too hard on your raspberries when picking. A ripe raspberry will leave the vine willingly. You may eat them fresh, freeze them or make into preserves. All varieties will begin to produce fruit in their second season. In some cases, ever-bearers may bear small berries in their first autumn.